SOS Children's Villages has been present in Bangladesh since 1972 and started supporting families and children in the city of Chattogram (previously known as Chittagong) in 1989. Poverty is widespread in this densely-populated southern Asian country, and political instability and environmental factors cause further misery. The city of Chattogram is situated in south-eastern Bangladesh. With over six million inhabitants, Chattogram is the second largest city in Bangladesh and home to the largest port in the country. The city is growing fast as the economy is developing - many industries are situated nearby. However, as Chattogram grows, an increasing strain is placed on the infrastructure, and a significant number of people live in temporary housing with intermittent access to essential services such as electricity and water. The district of Chattogram has more than one million people living in extreme poverty; food security is an issue for these people, especially as basic food items have become more expensive in recent years. Poverty is partly caused by a lack of employment opportunities, or the fact that those who are employed are paid low wages. Children often have to contribute to the family income and are sent out to work; they can be found in waste disposal facilities or in public places looking for recyclables to sell. Lack of education and training continues to be a problem, as illiteracy rates remain high, and people struggle to find employment due to shortage of skills. Corruption continues to be present, and in recent years there has been an increase in drug abuse in the area. The health services are under-funded and there is a shortage of staff and equipment. When the "War of Liberation" ended in 1971 many children were left without parental care. SOS Children's Villages approached the responsible ministry, who welcomed the proposal to support families in need and to provide loving homes to children who had lost parental care. Plans to start working in Chattogram were made after around 50,000 people lost their lives and many children lost their homes and parents during severe flooding in 1986. 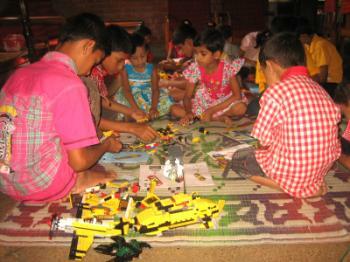 SOS Children's Villages works closely with the local population. In order to support vulnerable families in the neighbourhood, we offer family strengthening programmes which, in collaboration with local agencies, aim to ensure that children have access to essential educational, health and nutritional services. We run a day-care centre for children of working mothers and a training centre, where women from the neighbourhood can acquire useful skills, such as sewing and embroidery. Children are also given tutorial support with their school work. The clinic treats families and children from the local community and provides them with advice on preventing illnesses. Our organisation's vocational training centre runs training workshops for carpentry and mechanics. When children can no longer stay with their families they can find a loving home with one of the twelve SOS families, who can care for up to 120 children. The high illiteracy rate in the country makes the work of the SOS Hermann Gmeiner School particularly pertinent. The building that houses this primary school is adapted to serve as a shelter from cyclones, a feature which can save lives in the region. As children grow older they can move to the SOS Youth Programme, which has capacity for 36 young people. They live here while they attend further education or training. With the help of qualified staff, the young adults learn to shoulder responsibilities and make their own decisions.